Two regions will meld their gastronomic delights in a celebration of food and home-grown produce as part of this year’s Melbourne Food and Wine Festival. 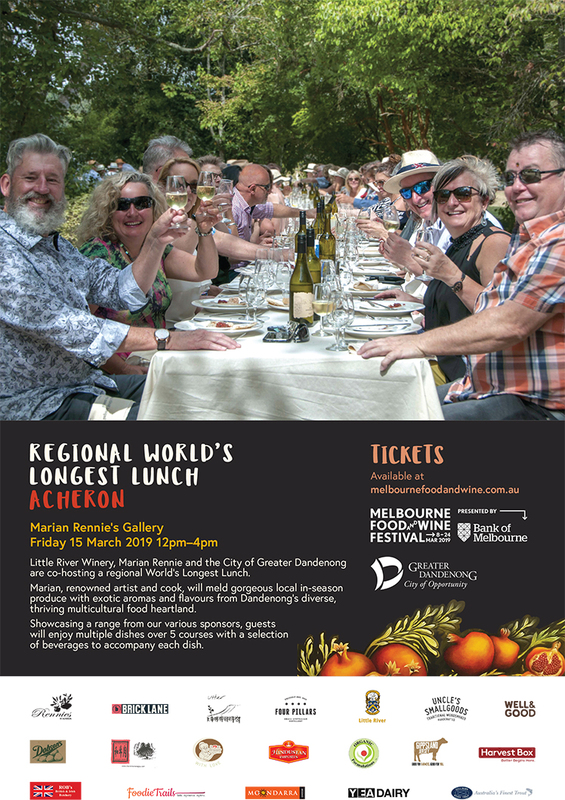 Little River Wines, Marian Rennie Gallery and the City of Greater Dandenong will co-host the Regional World’s Longest Lunch at Acheron on Friday, 15th March from 12pm to 4pm. Once again, they will join together to promote businesses and amazing produce from their communities. The event will be held in Marian Rennie’s beautiful historic garden located on one of the oldest farming properties in the Murrindindi Shire. Event co-organiser, Leanne McCready from the City of Greater Dandenong, said the Regional World’s Longest Lunch in 2018 provided a unique dining experience with more than 100 guests sitting at one continuous table; we will be replicating that experience with even more food stalls, taste sensations and merriment on offer this year. “Marian will use gorgeous local in-season produce from the rivers and ranges and blend them with the exotic aromas and flavours Greater Dandenong has become famous for,” Ms McCready said. Guests will be treated to a five-course culinary feast and will also receive a show bag filled with local goodies to enjoy at home. Bev and Leigh Fraser of Marysville will also be performing live music during the day.